The Mister has reminded me several times over the past week that it's not a good idea to marinate myself in the CNN coverage of world events. He's right, of course. The stress of reporting (and watching) in what is practically real time results in inaccuracies, repetition, and an onslaught of "authorities," some of whom have well-educated and well-researched opinions and some of whom don't. It's important to stay informed, and it's critical to remember that there's still a lot of goodness and beauty in the world, as well. Personally, I'm looking forward to a quiet Thanksgiving and enjoying the last bits of fall around the T&C House. The Mister and I visited the local farmer's market the middle of September for gourds and pumpkins to decorate the front of the house. We added a couple of Jack O'Lanterns a week or so before Halloween, and now it's back to the simple, and mostly green, color scheme. Considering all the rain we've had, I'm surprised they haven't rotted away already. I found the concrete (cement?) pumpkin planters at TJ Maxx a couple of years ago. I'm never really sure what to do with the lids. This imari bowl sits in the living room with a mixture of real gourds, cotton bolls, fake berries, real berries, and fake gourds. 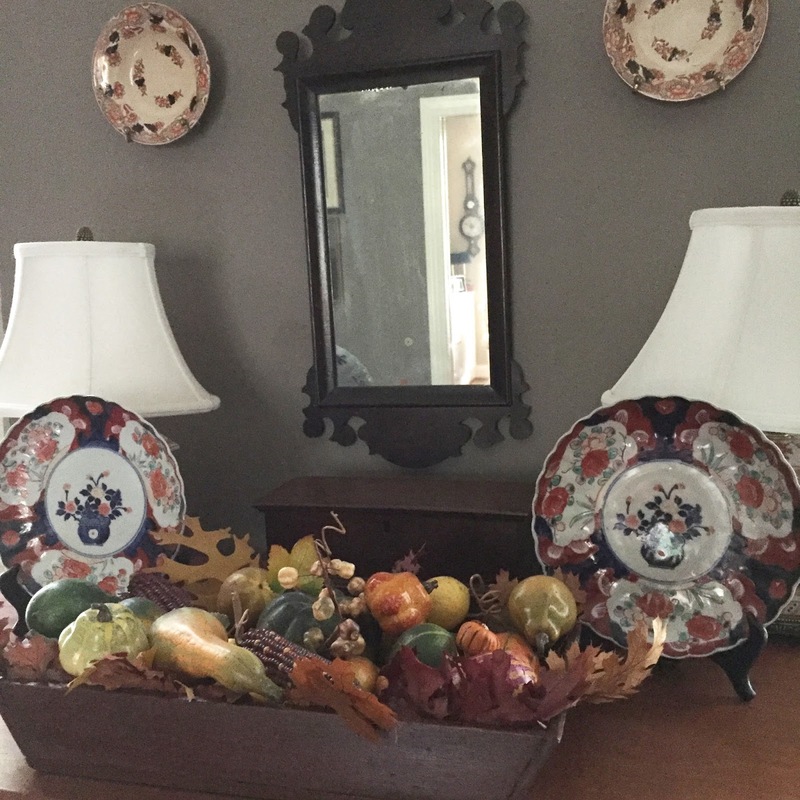 Also, in the living room, I filled a wooden tray with a mixture of real and faux to bring some fall into this room. I didn't edit these photos, so I apologize for some of the glare and graininess. 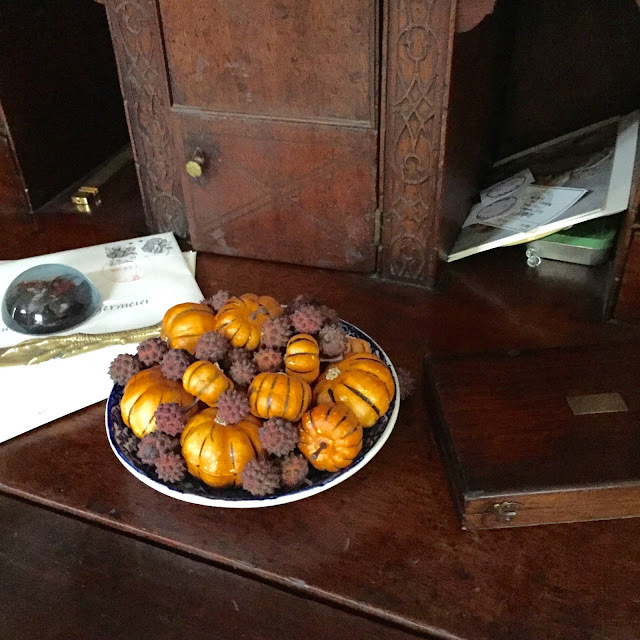 On the desk, I added these little fake pumpkins with some fruit from my parents' dogwood tree. When I first gathered those fruits they were red and slightly squishy. Eventually they dried out to these spiky little balls. In the family room, I added a small pumpkin to my ever-present bowl of Agraria Bitter Orange potpourri alongside a framed vintage Thanksgiving postcard. 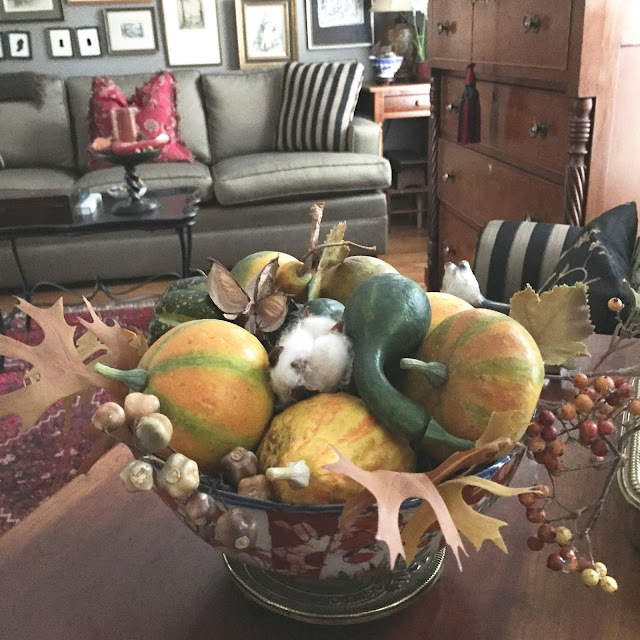 In the dining room, silver, gold and white pumpkins mix it up with a tole tray and some dried oak leaves on the sideboard. Random pods, seeds, acorns and leaves make a good base for antlers and an old wooden canoe. This was our table last year, and I loved how simple it was as far as "flowers." As you can see, there aren't any. I raided the produce basket in the kitchen for clementines and pomegranates, cut some magnolia, picked up a few pinecones and brought in a pumpkin from the front porch. We did use a nice tablecloth, napkins, and china. I'm thinking this year, I may do something more casual. Our menu is fairly simple, too. We have a lot to be thankful for, and we're looking forward to the homecoming of the little pilgrim who made this--truly a self portrait of Middle at age three. Enjoyed your post and. "stroll" through your home. Not surprising, our Thanksgiving menus are very similar. Do you have a recipe for the mixed green salad? This year, we will gather at our house with our three girls, my favorite father-in-love, and J & S. We will return thanks to God for friends like you. Thanks, Donna. For the salad, I'm roasting cubed butternut squash (already cubed from Trader Joe's), quartered Brussel sprouts, red onion, and bacon cut into 1/2 " bits. Then I'll top mixed greens with that and offer either goat cheese or bleu cheese crumbles "on the side." I hope you all have a most lovely Thanksgiving! I wish you a very quiet and peaceful and loving Thanksgiving. Thanks, Lisa. I wish you the same. Enjoy your day without the hostessing/cooking duties!